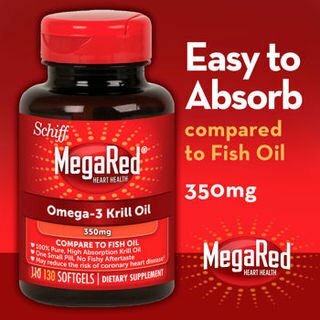 MegaRed Omega-3 Krill Oil provides an optimal combination of omega-3 fatty acids, phospholipids, and the powerful antioxidant astaxanthin to support your heart health. SUPPORTS CARDIOVASCULAR HEALTH : MegaRed Omega 3 Krill Oil Supplement has been shown to significantly increase your omega-3 index in just 30 days. If you have any questions about this product by Megared, contact us by completing and submitting the form below. If you are looking for a specif part number, please include it with your message.